Most languages when they are in their infancy, tend to be considered "toy languages" and are only used for trivial or small projects. But this is not the case with Elm, where its true power shines in complex and large applications. As you can see, we don't actually have to deal with any control flow in the application, being Elm a functional language, we just declare things. We have a list of documents called documents, where we store all the documents from the database. We don't need a Maybe value here; if we don't have any documents we can have just an empty list. The rest of our model consists of a list of documents, which by default is empty, although it's populated once the getDocumentCmd command finishes. There are also values for the current document and a new document, both being Nothing. In the second case, where there was an error, we match it with a value of type Err and we can use an _ as a placeholder for anything that could be there. In a real world application we could show an information box to the user informing about the error, but to avoid complexity in this example, we will just simply ignore it; so we return the model again without any changes and also we don't execute any command. Subscriptions can be a common thing in a lot of applications, and although we didn't use subscriptions in this example, their mechanism is quite simple: they allow us to listen for certain things to happen when we do not know when they are going to happen. Excellent article, thanks so much for writing it! 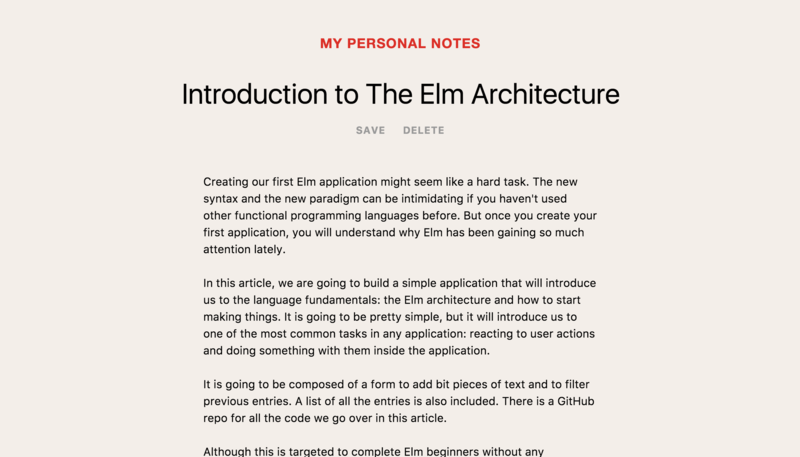 I had Elm in my sight for a while, but your article gave me the little push needed to dive into it. Question about views: is there a way to write an HTML document and then connect to some elements to display/hide them instead of having Elm creating and deleting the DOM tree branch? I had the same issue with the React Router View. Thanks for the pointer James. I was more wondering if there was a way to get the HTML node of an existing HTML structure (like the Ref in React or the jQuery element $(selector)) and then work on the node attributes/properties directly from Elm? It seems to me that the only way to work with HTML in Elm is having Elm generate the DOM (or virtual DOM) and not pigging back on an existing HTML/DOM? I don’t think that’s possible in Elm. As you mention, Elm uses a virtual DOM, and as far as I know, there is no way to avoid it. 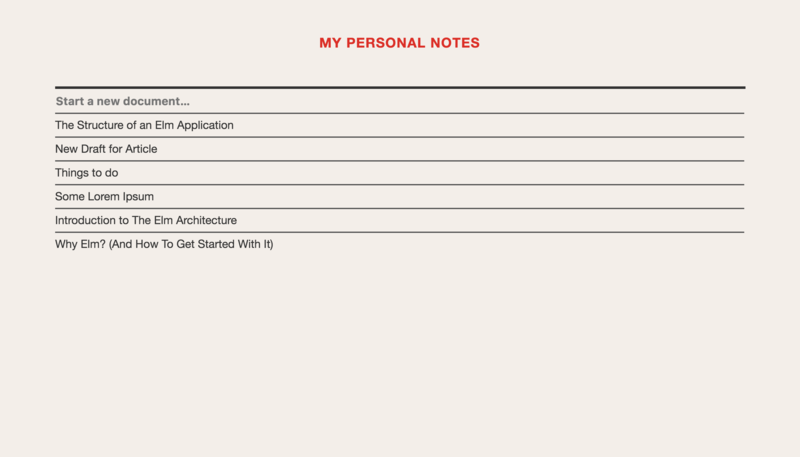 Any value that changes in your application has to be defined in the model then your DOM can reflect those changes, instead of making changes directly in it. Let me know if that’s clear!